For some reason whenever I take my English Paper Piecing hexagons out I think of this Justin Timberlake song (may not be 100% SFW, depending on where you work ;) ) So yes after a winter hiatus I'm bringing Hexies back & there's a small giveaway of 1" hexagon templates too! At the Fat Quarterly retreat last summer I caught the English Paper Piecing bug and made quite a few 'flowers' using 1.25" hexagon template. To me EPP'ing is typically a slow craft. The Hexagon flower project may take years to finish but that's ok. I have now started a smaller project (a pillow) with some of the 1" hexagon paper templates my friend Paloma sent me. Paloma has just started selling these in her shop and for a very fair price too: $2.50 per 100 templates. Obviously I had to try Paloma's templates first before telling you about them and they work absolutely fine for me. They have 6 sides of equal length (which may sound obvious, but trust me: it isn't) and the paper is not too thin and not too thick. I know Paloma has quite a few templates in stock so why not treat yourself to a pack (or 2)? Other template sizes may be available in the future. If you'd like a chance to win a pack of Paloma's 1" hexagon templates, please leave a comment on this post before Saturday 13th of July, 12 AM (Amsterdam time). (comments are closed, winner will be announced tomorrow the 14th of July). 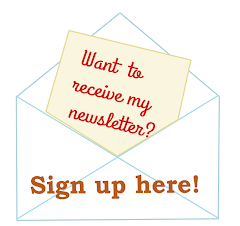 Be sure to leave an e-mail address or other trail so I can trace you if you're the lucky winner. If I'm not able to contact you, I'll pick another winner. I also would love to hear what you would make with these paper templates! Trabalhar com hexágonos traduz-se em lindas peças onde o tecido e as mãos da artesão dão o toque final. Working with hexagons translates into beautiful pieces where the fabric and hands of craftsman add the final touch. I would love to give her precut papers a try, thank you for the chance. 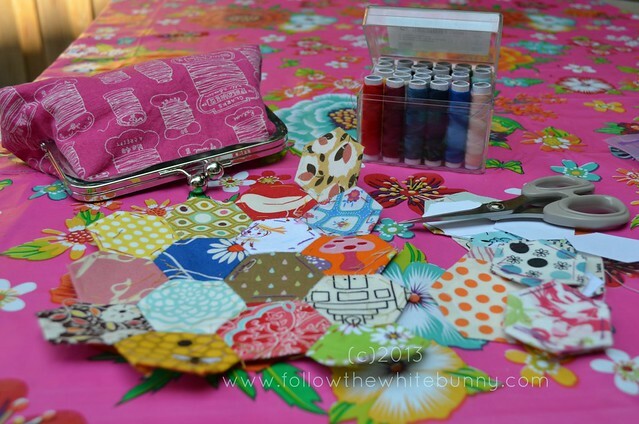 I would love to try Paloma's hexi papers! I have all sorts of hexies waiting to be assembled but none as small as 1"!! Wow. Yours are adorable. Thanks for the chance to win. I'd probably make a pillow too. I would love to try these out! I've never made a hexagon quilt because they seem so intimidating. :) I really want to try, though! I just caught the hexi bug and am making a mini quilt. I would love to try these templates as Iam cutting out my own right now. Thank you! 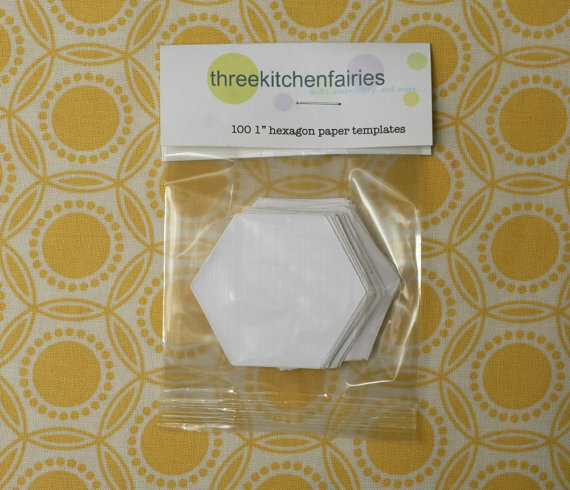 I would like to try these hexagons, I love hexies and my last lot of cut papers I made were not accurate!!!! Sou viciada em hexágonos,faço sempre,nunca comprei nem ganhei pré-cortados,tenho um molde de papelão que corto em revistas .gostaria desses de Paloma.Obrigada. Nice. Thanks for the doing this giveaway. I would love to win some of these. Thanks for the chance. I really like the idea of a slow burn hexie project. I still need to finish my hexagons cushion that I started at FQR last year. I just need to square it off with some half hexagons but for some reason at the end of last summer it got put into a box and hasn't come back out. Perhaps this year's FQR is the perfect opportunity to dust those hexies off and get it finished! Hexies are SO addictive! I've been thinking about making ah exie quilt for my baby although she'll probably be 18 before I finish it! My daughter and I want to start making some hexies! they look like so much fun to make. I would make a tote bag for a Sept getaway weekend I am going on! thank you! I would love to try hexies! I have been making yoyos and having ablast! I love to do EPP! It is so addicting but it is also so relaxing. I love doing handwork! I'd love to use these 1" templates to make a front for a zippered pouch to carry my handwork in. This is the perfect size to see the fabric and it's so cute as well, hehe. Thank you and Paloma for a super giveaway and a chance to win. 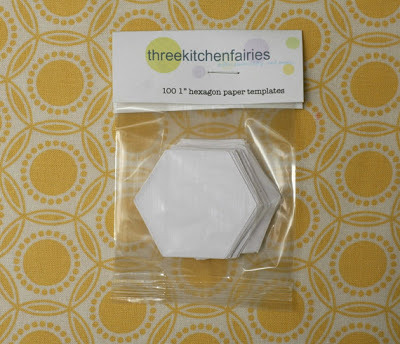 I would love to try Paloma's templates as I always have at least one EPP project on the go and my least favourite part is to cut out hexagons. I love the idea of making a scrappy cushion cover with all the small scraps that are in my 'small scrap bin'. Thank you! I've never used hexagons quite that small before, but it would make a good scrap project. I will see you in London very soon. I've been wanting to try EPP for a while, if I can get organised I'm going to bring some on holidays with me for that first trial. I love the idea of pre-cut templates, finding time to cut my own is what has prevented me trying EPP before this. I'm ready to jump on the hexi bandwagon! Thanks for the chance. Rcoyle@olemiss.edu. PS. Love yours! I love hexies, maybe I could make a little blankie for my granddaughter. Thanks for the chance. Well, since I have never tried EPP using hexagons, I think it would be quite fun! It would be a perfect project to take anywhere too! My first project would be a new pillow cover, a project that is not too big and wouldn't take forever to complete! out under the trees by the river. Thanks for the chance to win! Oh my goodness, what a timesaver these little templates would be! They would certainly inspire me to get started. I've never had the nerve...! I love EPP during the summer especially! Great take along project! I am in the Inchy Flower Swap and we make 1" flowers - so I am always needing more! Thank you for the chance! Hexies are such a great summer take along and I'd love to try some of Paloma's! Count me in! And, thank you.